Big Bavarian-style hard pretzels are dunked in luscious milk chocolate and finished with a sprinkling of crushed English toffee pieces. Presented in a jolly, wintry keepsake tin, this sweet gift is totally irresistible. 8 Bavarian Chocolate Toffee Pretzels. Your gift is securely wrapped to safeguard the shipping process and arrives presentation-ready in a gift box. A complimentary card with your personal message is included with your gift. 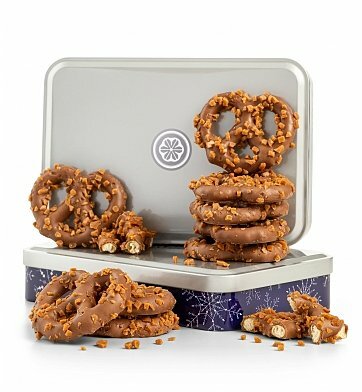 Toffee Chocolate Pretzels Tin is a hand delivered gift. These gifts are delivered by one of our local design centers located throughout the United States and Canada. Same day delivery is available for most gifts when ordered before the cutoff time. The cutoff time for Toffee Chocolate Pretzels Tin is in the recipient's time zone. Luscious chocolate meets a snowfall of crushed English toffee.